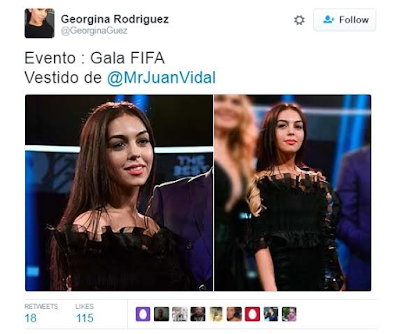 Georgina Rodriguez, who has been dating football star Cristiano Ronaldo since November last year and was officially introduced to the world when she accompanied the footballer to the FIFA Awards Gala in Zurich on Monday, has joined Twitter following the publicity she’s garnered the last couple of days. And guess what.. her first Tweet was about her man! 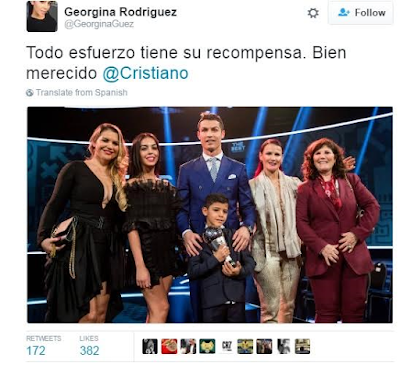 Her tweet was even retweeted by Cristiano Ronaldo’s mum and Georgina retweeted two other posts, all the posts about her memorable night with the footballer at the awards night.